William Ricketts Sanctuary, in the Dandenongs near Melbourne, Australia This month your intrepid reporter braves the wilds of Melbourne's public transport system (the Met) in search of something nice to photograph. 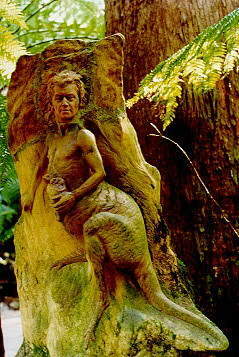 In October, 1996 I made a foray into the Dandenongs. Since I'm currently living out that way, it shouldn't have been that much of a trek. It was an extraordinary trip. My question was, "where can I go to take some good pictures of public parks?". Apparently that question wasn't in English. I thought it was. But boy, did I get a lot of confused looks. I started at 10 in the morning along the Burwood Highway. I got out at Upper Ferntree Gully railway station, where the bus driver assured me another bus would come along and take me to Olinda. An hour and three of the same bus later, a passenger suggested that the Olinda bus didn't actually go from the station during the day. He suggested that I asked the people at the railway station. Considering that the railway Met employees are extraordinary in their unhelpfulness at almost every opportunity, the men at the railway station were very helpful. Man # 1, after some thought, translation and discussion suggested that I walk along the main road for 15-20 minutes, turn left and climb about 1,000 steps to a lookout indicated on my Met map. Man # 2 said that the lookout was no longer there. Man #3 asked if I had gone to Burwood High. Since I haven't been to high school in about two decades I forgave them everything and took the train to Belgrave. Belgrave is the starting point for the Puffing Billy steam train. When I got there the train was hours away. I practised my picture-taking question on the staff in the tourist shop. Not much help. But I did find a Melbourne Parks and Waterways brochure about the Mt Dandenong Tourist Road. According to the brochure, I could get to a couple of the sites along the Mt Dandenong Tourist Road by public transport. The Parks & Waterways people were helpful on the phone, enthusiastic even, so off I trotted to the bus stop. The bus from Belgrave to Olinda meets the bus from Croydon at Mount Dandenong and two buses later, there I was, at the William Ricketts sanctuary. And only 3:05 p.m. I was back at the bus stop at a couple of minutes past 4:00 p.m. and after waiting for a bus that was only 25 minutes late, I was off to Croydon railway station for a train and a bus and back home. Yes, there is public transport but only Monday to Saturday and there is a gap of as much as two hours between buses. The suburban sprawl of Melbourne is getting closer to the Dandenongs with each passing year. Fortunately some of the early residents, such as William Ricketts, have left their homes and gardens to the state. There are several notable parks and gardens along the Mt Dandenong Tourist Road, many cared for the Melbourne Parks and Waterways department. The Dandenongs are above the snow line in winter, and in summer they are kept cool by the forests. Much of the area is protected, and although there are many homes up there, it is not too built up. You will never go hungry in the Dandenongs if you like Devonshire teas (with or without coffee). I had the tea at a wonderful tea shop over the road from the William Ricketts Sanctuary. The food looked great. People sat outside in the courtyard because it was such a nice day (even me). It was a licensed, no-rush, establishment with a gorgeous garden. A local Rosella joined us for afternoon tea . If you are thinking of an outing by public transport, you could probably do two gardens on a day. The kids might be a bit boisterous among the fragile statuary at William Ricketts sanctuary, but there are plenty of other places to visit, and the view from the Dandenong lookout is breath-taking.